In a show dominated by 8K TVs from the likes of LG and Samsung, Sony has a slightly different announcement for its IFA 2018 appearance – one that will be hard to keep quiet once the cans are out of the bag. 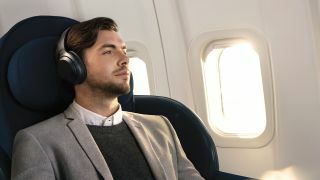 Earlier today, Sony unveiled its new WH-1000XM3 noise-cancelling headphones, the sequel to the Sony WH-1000XM2, and the heir apparent to the highest seat in the noise-cancelling headphone kingdom. The reason Sony stole the hearts and ears with the 1000XM3’s predecessor was its excellent noise-cancellation modes, Quick Attention Mode and aptX/aptX HD support, all of which will be available again in the 1000XM3. Like last year, you can expect a 30-hour battery that should easily get you across the Atlantic and back. What’s improving this year, according to Sony, is the introduction of multiple microphones that will help calls come through cleaner and a switch from a microUSB port to a USB Type-C port along the earcup of the headphone. Along with that a Quick Charging function that provides up to 5 hours of wireless playback after just 10 minutes of being connected to a power source. In a brief demo with the 1000XM3 headphones ahead of IFA, we noticed a substantial improvement on noise-cancellation from last year’s 1000XM2 to this year’s 1000XM3 – even if the audio sounded relatively similar year-over-year. Powering the 1000XM3’s noise-cancellation prowess is Sony’s new QN1 processor that’s faster than last year and offers more powerful processing, too – things we couldn't tell from our time with the headphones but a neat upgrade all the same. The Sony WH-1000XM3 will be available starting in September for $349.99 (around £270, AU$479).